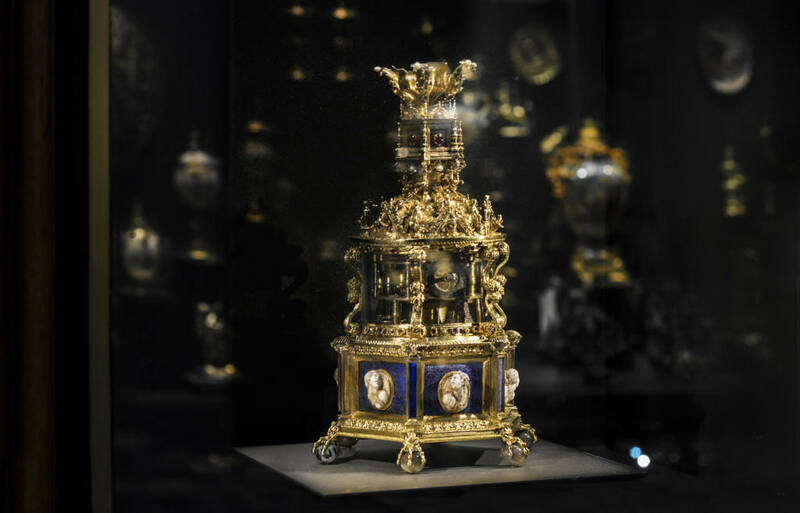 One of the greatest treasures of the Goldsmiths’ Company Collection, the Royal Clock Salt, is now on display in the Waddesdon Bequest Gallery at the British Museum in the Gallery’s Visiting Object Case. The display follows an intensive period of scientific research by the British Museum team to learn more about its origin, history and construction. For example, the clock movement will be studied for the first time and the salt will be closely compared to a casket by the same maker in the British Museum’s collection. Probably a diplomatic gift from King Francis I of France to King Henry VIII of England, or between two of their courtiers, the Clock Salt was made in Paris around 1530-35 by the royal goldsmith, Pierre Mangot. As a display piece, it functioned both as a table clock and a salt cellar. A design by Hans Holbein the Younger shows a clock salt which was to be presented by Sir Anthony Denny to Henry VIII in 1545. Of the eleven clock salts listed in Henry’s collection after his death, only this one survives. It reappears in inventories until it was sold from the Royal Collection after the Civil War in 1649. It is one of only four known surviving pieces from the several thousand items of goldsmiths’ work that once belonged to Henry VIII; another is the fifteenth-century French Royal Gold Cup in the British Museum. Mangot supplied luxury goods for the French court which incorporated precious and exotic materials, such as the Sibyls Casket in the Waddesdon Bequest. The Royal Clock Salt bears Pierre Mangot’s personal mark and was hallmarked in Paris c. 1530-35. The last time the Clock Salt left Goldsmiths’ Hall was for a loan to Tate Britain for Holbein in England in 2006. The timing of this loan has been planned to allow the display to dovetail with the exhibition of a famous set of Renaissance silver known as the Aldobrandini Tazze at Waddesdon Manor from April to July 2018, sponsored by the Rothschild Foundation. For further information on the Silver Caesars: A Renaissance Mystery exhibition please click here to visit the Waddesdon Manor website. The loan will culminate in a one-day conference at Goldsmiths’ Hall on 22nd November 2018, which will shed light on the object’s history, its attribution and the modifications it has undergone. More details about the conference can be found on the Goldsmith’s website. A free gallery talk discussing the Royal Tudor Clock Salt will be given by Eloise Donnelly on Wednesday 16th May 2018 at the British Museum. For further details please click here.